Last week Wednesday evening, at the Basin Blast, saw the Melbourne Stars go on to defeat the Wellington Firebirds. 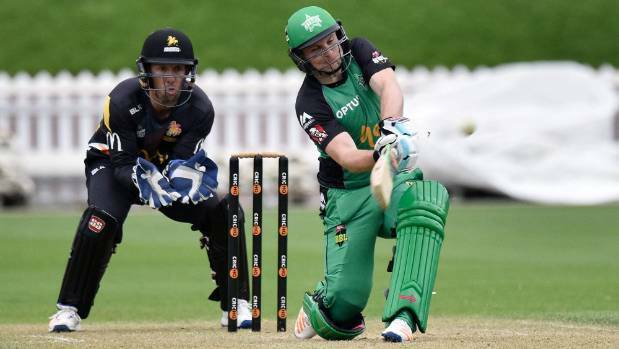 In a chase of 169 for victory, Luke Wright, Melbourne’s English import bludgeoned the attack of the Firebirds to all parts, as he went on to score 112 from 63 balls. During his knock, Wright was able to clobber eight sixes and nine fours, all at an ease, even as a substantial crowd of spectators watched from the banks of the Basin Reserve. From the start of the match, Wright was at his very best as he pushed on to give Melbourne a quick start into their chase of 169. If he was not on hand to provide catching chances to those at the bank, he was out sending out such savage blows towards the base of the Museum Stand that seemed determined to check its structural integrity. All the damage had already been done by Wright, when David Hussey put on a brief show of his, blasting 36 from 18 balls late on. However, with just 17 balls remaining, Melbourne was able to ease home safely to victory. One Melbourne Stars player that seemed too economical with the ball against Wellington Firebirds was Ben Hilfenhaus. Against most of Melbourne’s bowlers, the Firebirds were able to score quite freely. However, it was Hilfenhaus that caused the major headaches to the team as he held on to concede just 22 runs in his four overs. For Wellington, it was mainly Michael Pollard that was able to accelerate in the game for them, as he scored a quick fire 45, from only 19 deliveries. He went on to send one straight up, which saw Jackson Coleman take the catch quite well from his own bowling.